Greetings again from the darkness. More film footage exists of Ronald Reagan’s eight years as President than the previous five administrations combined. Under the guise of pulling back the curtain on how this was orchestrated by the actor-turned-politician, co-directors Sierra Pettengill and Pancho Velez instead seem more focused on delivering a hatchet job on the 40th U.S. President known as “the Great Communicator”. 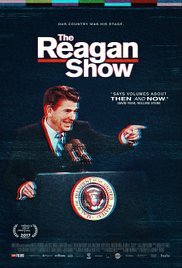 With the exception of a few talking heads (Tom Brokaw, Walter Mondale, Peter Jennings, Sam Donaldson, etc), the film exists almost entirely of archival video and film footage from Reagan’s time in office. It kicks off on December 21, 1988 as Reagan and film crew prepares for his final interview with David Brinkley. The closing sequence shows Reagan’s final day in the White House as he leaves the Oval Office for the last time … and how it was choreographed for the cameras. Two things are quite evident in showing what the filmmakers were after: an emphasis on the Cold War and the PR battles between Reagan and Mikhail Gorbachev, and the parallels and comparisons to the current U.S. President … though Donald Trump is never mentioned. Gorbachev was the only politician up to that time who could match, or even eclipse, Reagan’s comprehension of the value in controlling the public relations (as opposed to media relations). As a precursor to the Reality TV era, the 1988 Moscow Summit even featured TV shirts made in the United States! The Trump comparisons seem endless and lightly-veiled as we see Reagan manipulate and clash with the media, while also strategically evading when necessary. With a slew of Democrats, journalists, and broadcasters casting aspersions and doubt on Reagan’s competency and commitment, there is even the accusation that he depended on his staff too heavily. This stands in stark contrast to what these days is reported on Trump – someone who doesn’t depend enough on staff and advisers. We can’t help but take note of how it’s always the media and opposing party making these determinations and judgments. Additional pot shots occur around the Iran ‘arms for hostages’ scandal, and it comes across as if the filmmakers think the close relationship between Ron and Nancy (“I thought I married an actor”) somehow proves their point that he was disengaged as President. That’s right, the point of the documentary has little to do with how Reagan played to the camera (which is the premise being sold), but rather how they judge him to be style over substance. The footage utilized is excellent and the film is well structured, but most documentary viewers would prefer the filmmakers be upfront about their mission. Own it. This entry was posted on Thursday, June 29th, 2017 at 10:19 pm and is filed under Documentary. You can follow any responses to this entry through the RSS 2.0 feed. You can leave a response, or trackback from your own site.